Why do majority congressional parties seem unable to act as an effective policy-making force? They routinely delegate their power to others--internally to standing committees and subcommittees within each chamber, externally to the president and to the bureaucracy. Conventional wisdom in political science insists that such delegation leads inevitably to abdication--usually by degrees, sometimes precipitously, but always completely. In The Logic of Delegation, however, D. Roderick Kiewiet and Mathew D. McCubbins persuasively argue that political scientists have paid far too much attention to what congressional parties can't do. The authors draw on economic and management theory to demonstrate that the effectiveness of delegation is determined not by how much authority is delegated but rather by how well it is delegated. 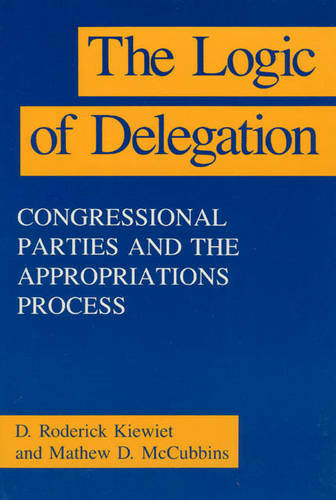 In the context of the appropriations process, the authors show how congressional parties employ committees, subcommittees, and executive agencies to accomplish policy goals. This innovative study will force a complete rethinking of classic issues in American politics: the "autonomy" of congressional committees; the reality of runaway federal bureaucracy; and the supposed dominance of the presidency in legislative-executive relations.